You know how it goes, one day -almost without noticing- you entertain one thought, one worry, one doubt, one fear, one question, one… and then two days later, and then three days later, and the next week, and the week after that you have a wandering mind, with no limits whatsoever, your spirit is troubled, and of course, you feel heavy burdened. Go back to the Word of God. Go back to the Scriptures and mediate on them day and night. Memorize God’s Word, pray it, recite it, mutter it. The Word of God will dissipate all doubts, all fears, it will strengthen your heart. It will help you fight those vain thoughts. How true this is! Let us come, to the Word. Let us abide in it, let us persevere with all diligence to keep it in our heart and mind. Jesus said, “Come to Me, all you who labor and are heavily burdened, and I will give you rest.” How do we come to Him? We come to Him in prayer and we find Him in the Word. It is there where we hear Him speak to our need, to our troubled soul. Is your heart troubled and your mind wandering today? 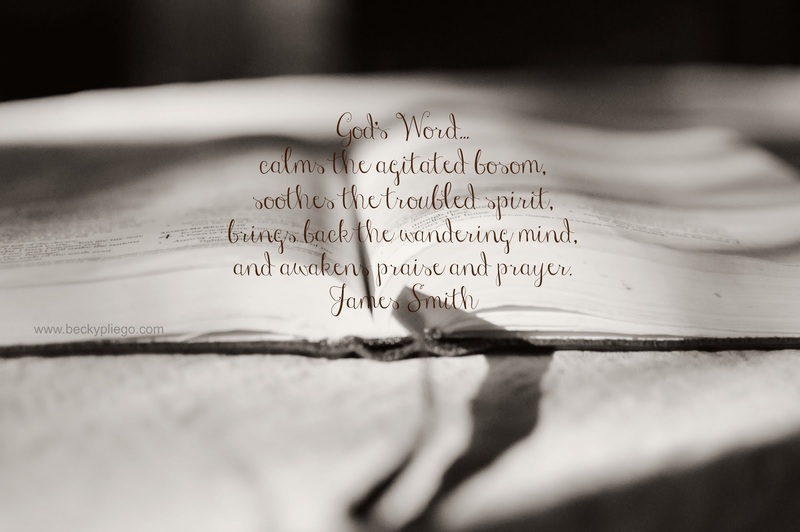 This entry was posted in Bible_Reading, Exhortations, James_Smith, Living_in_the_Sacred, Meditations, Memorization, Sanctification, Spiritual Disciplines, Studying_the_Word by Becky Pliego. Bookmark the permalink. I'm thankful for you Becky! Your words have blessed my heart this day! How PRECIOUS God's Word is!! How PRECIOUS our Saviour is!!! This affirmation has been on my heart much again lately. As much as I enjoy books I feel that so much devotion to reading what others have to say can rob me of time to read and meditate on the Scriptures for the simple pleasure of knowing and communing with Him better. This blessed me today. Much love to you Becky.